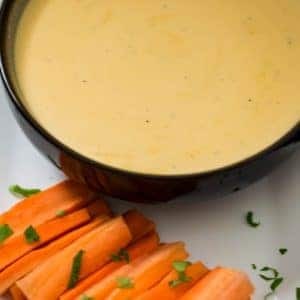 Beer Cheese Dip is one of my most important additions to any tailgate, Superbowl, or food party! Why, because it is just dang delicious with all that cheesy goodness! Dip your favorite pretzels, veggies, baked pita chips….I can keep going, into this fabulous bowl of goodness! It is quite obvious, my love of cheese is strong! I am so excited for you all to try this amazing dip! It is a hot cheese dip that is a combo of melted cheese and beer, ah hello? Delicious, right? Despite my team not being in the Superbowl, I wouldn’t miss the big game and neither would my family! This also means we talk a lot about our menu for the big game! A recipe that is a must make is this easy and hot Beer Cheese Dip! We like to have a variety of foods for our parties! They always include a variety of proteins, like Crispy Baked Coconut Shrimp, Baked Chicken Wings, and BBQ Ribs (recipe this week)! 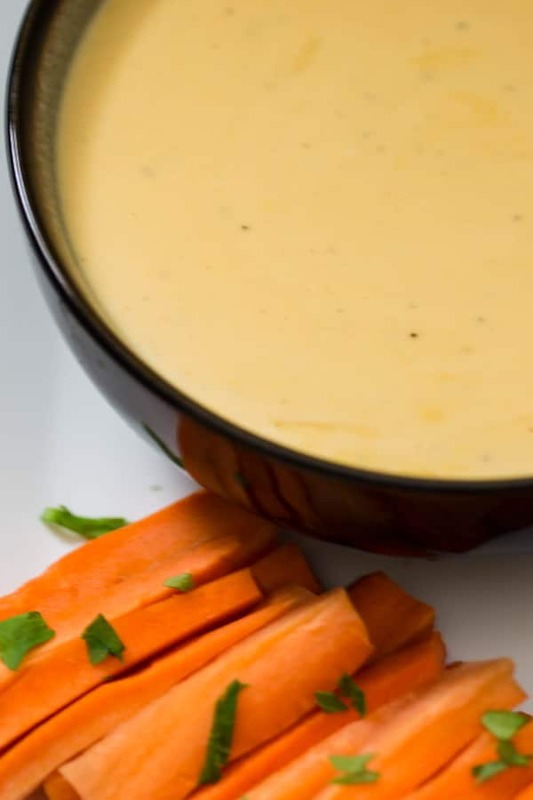 Having dips with veggies is a big must-have as well and this delicious cheese dip recipe pairs so well with veggies too! Beer Cheese Dip is one of those recipes I have been making forever! It is hot and cheesy with tasty flavor from a good bottle of beer! Whether you enjoy the dip with pretzels, veggies, chips, or toasty bread – you will be hooked on the recipe, trust me, it’s so good! When I make this recipe, I mix low-fat with regular cheese to try and keep calories at a lower point. It is a cheese dip so there are calories. Using lower calorie mozzarella cheese anNeufchatelel cheese keeps calories lower and the flavors are great! What type of beer is best for a good beer cheese dip? A good lager, ale, or stout makes a great beer cheese dip. I use Yuengling for this cheese dip because it is a favorite beer of the hubs and it works really well in the cheese dip. Choose a favorite or yours and experiment with some of your favorite beers. Can this cheese dip be made ahead of time? This is an easy dip to make but it can be made ahead of time and reheated in a slow cooker or on the stovetop for a few minutes. Details below in the recipe. What are the best cheese combos for a good beer cheese dip? Use a combo of cheeses. Usually a mix with cheddar cheese and mozzarella, gouda, brie, or fontina! Again, experimenting is always a good thing. What is not to love about trying various melted cheese and beer? Can I add ingredients to this cheese dip? Absolutely! Use this dip as a base and add in when needed other ingredients like bacon, caramelized onion, diced tomatoes, and diced peppers. Can beer cheese dip be frozen? It is not recommended to freeze this dip. Cream cheese does not freeze well. This dip is super easy and quick to make so it is not a big deal to make it when you are ready to enjoy! What goes well with Beer Cheese Dip? Homemade Boursin Cheese: Fast becoming a favorite recipe for you all as it is for my family, thank you and enjoy! Pimento Cheese Dip: A Southern favorite, actually a favorite by everyone I know too, yum! 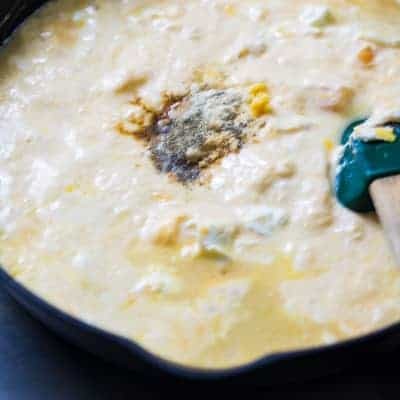 Jalapeno Popper Dip: A delicious zesty recipe from Beyond the Chicken Coop, this is a great cheesy dip! 7 Layer Dip: Layers of deliciousness from Courtney’s Sweets, oh my is this delish! Taco Dip: I cannot resist this taco dip from Sugar Spun Run! Yummo! Heat the cheese over a low simmer. Too hot may burn the cheese. Use block cheese and either chop or shred the cheese for the dip. Pre-shred cheese has a waxy coating and I Don’t recommend for a melting cheese recipe. A combo of cheese is always great in this recipe. Use a good melting cheese like mozzarella with another cheese. Cast Iron pans are great to use to make a good Beer Cheese Recipe, holds the heat really well. 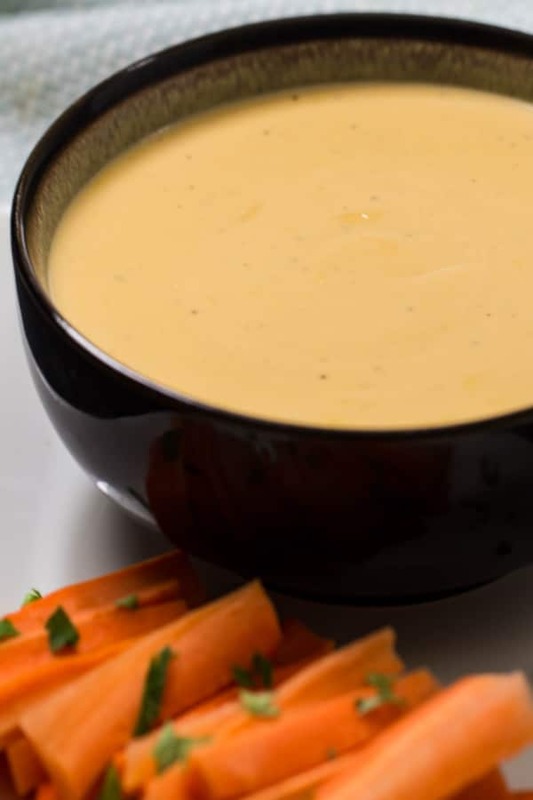 A slow cooker on warm is a great holder of the warmed beer cheese for serving. Add more beer if the cheese dip gets too thick after sitting in the warmer. 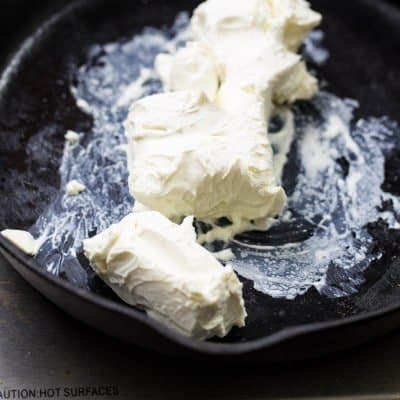 Add cream cheese to a cast iron pan that is warmed over medium heat. Stir in cheddar and mozzarella cheese. Blend in beer, spices, and ground mustard. Stir and blend until cooked through. Serve with pretzels, veggies, fruit, etc. This recipe was added to Meal Plan Monday’s Recipe Collection! A delicious hot and cheesy beer cheese dip! Easy preparation with just melting cheese and beer with some spice to make a delicious dip! Perfect paired with bread, pretzels, fruit, and veggies. A must addition for any tailgate, Superbowl, family parties! 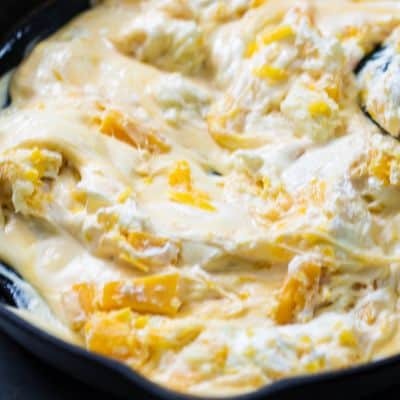 In a pan, preferably cast iron, over medium heat add cream cheese to melt. Blend in the cheddar and mozzarella cheese and whisk. Add the beer and stir. Blend in the Worcestershire Sauce, mustard, garlic powder, onion powder, and black pepper. Whisk until all melted, about 4-5 minutes. Serve with your favorite snacks. Note 1: Neufchatel is lower in fat. Regular cream cheese can be used. I do not recommend fat-free cheese, it does not melt as well. Note 2: Use block cheese and shred or cube. Pre-shredded cheese has a waxy finish and does not melt as well. Note 3: Use a lager, ale, or stout. 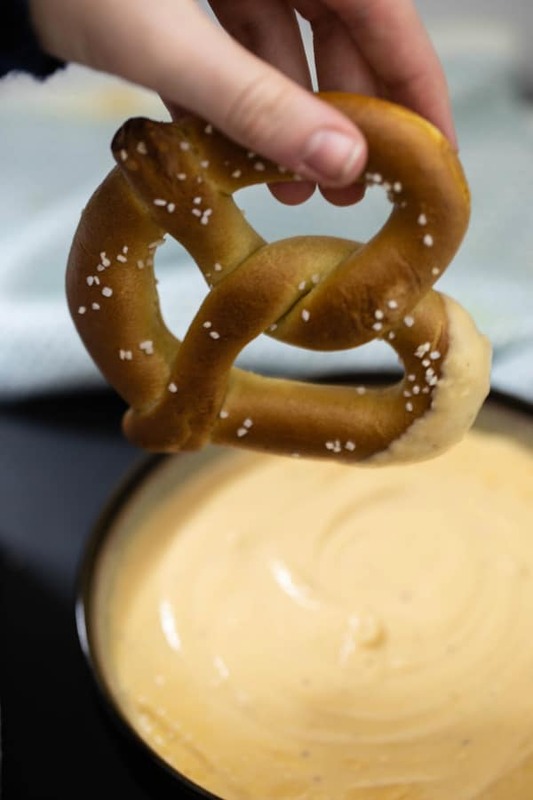 Note 4: Serve this beer cheese dip with any of your favorite snacks: Homemade Pretzels, chicken tenders, chicken wings, chips, veggies, apples, any of your favorites. This is such a perfect dip for any gathering or occasion! 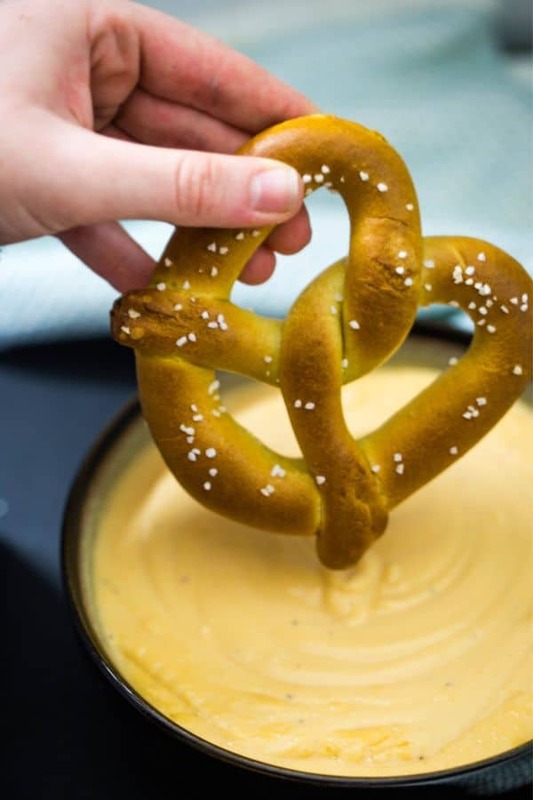 Everything you listed as a dipping option sounds delicious, but I really want to get my hands on a soft pretzel dipped into this beer cheese dip! Thank you so much Julie! It is a great cheese dip and we love it with pretzels too! Wow this cheese dip looks delicious! Loving the flavours you have put together in here. I wish I found this recipe earlier, so I could have added it to my super bowl party menu. Pinning to try it on another occasion. Thank you Sam! I hope you enjoy! 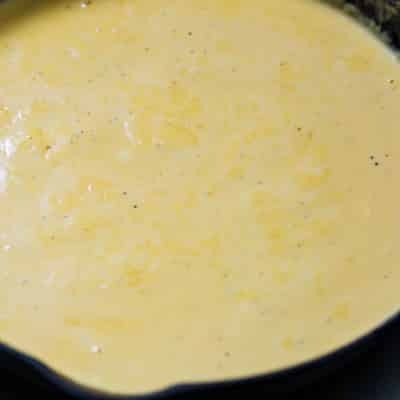 I love the idea of using this cheese dip as a base and then going on from there! But I’m sure this beer cheesy dip tastes great otherwise too! Thank you Saima! It is a tasty dip! I’m with you – my team has been long out of the running, but I can still get behind the yummy game day snacks! And beer cheese dip is where it’s AT! This looks amazing, especially with that chewy soft pretzel! Thank you, Monica! I could eat this beer cheese dip everyday! I’ve GOT to try this. Can you believe I’ve never had beer cheese? Thanks for the great recipe. Karen, yes you need to change that and enjoy a big bowl of beer cheese dip! This looks so comforting and morish! I want to dip all sorts of veggies, bread and pretzels in it right now! You also mentioned the addition of bacon, and I might have swooned just a little bit… ? Thank you Elizabeth! I am happy you enjoy the recipe! Oh me too, I dip everything in this cheese dip! I am happy we changed that today Michelle! Enjoy the beer cheese dip! Count me in! I am also a lover of cheese, I could eat it on just about anything… I’m looking forward to trying this on a number of my favourite dishes! You and me both Aleta! Cheese and beer combined, hello yummy! BEST BEER DIP EVER!!!!! I love making beer dip anytime we have people over, it’s one of everyone’s favorite dips!! Thank you Jennifer! Beer Cheese Dip is so delicious! We are having it at our Superbowl Party! Always a hit! This is something I’ve had and always wanted to try! Thank you for the recipe. Just in time for the Super Bowl! I hope you enjoy the dip Kelly! We love it! This beer cheese dip looks fantastic Eileen! We are going to a Super Bowl party Sunday and thinking I need to bring this dip because everyone will love it. Happy weekend to you! What a great idea Karrie! I hope you check back after making the dip and have a great weekend too! This beer cheese dip looks fantastic Eileen! We are going to a Super Bowl party and thinking I need to bring this dip because everyone will love it. Happy weekend to you! Blame it on the fact that I am European but I feel so out of this world when I read about those Superbowl foods. I think I never had a hot dip in my life and the more I stumble upon such recipes the more I’m convinced I should try these recipes soon! Eva, my Irish roots, we did not have hot dips either. I made up for it with American dishes :)! This is a good one to start with. I never knew how easy beer dip was to make. Where has this been my whole life? Des, yes we need to fix that asap! Make some beer cheese dip and savor the moment! Now I am craving this along with a pretzel. I bet it goes with so many different snacks. Absolutely Jacque, we have this beer cheese dip year round with everything from veggies, pretzels, chicken tenders…the list keeps going!